Fitness is an interminable series of fads, some backed up by legitimate science, others quickly debunked. The evolution of running is a perfect example of this—a fascinating and completely cyclical evolution. Over the last decade it has become increasingly popular to “run like our ancestors” in very minimalist footwear or even totally barefoot. Like any other craze, there are benefits and disadvantages to so-called “minimalist running,” but science has recently uncovered a fascinating benefit that has nothing to do with your half-marathon time. 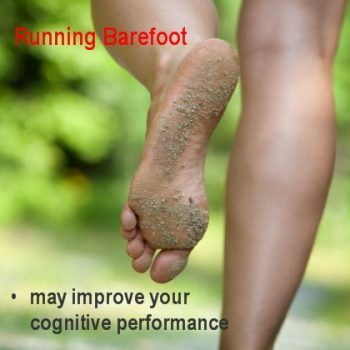 Researchers at the University of North Florida recently discovered that running barefoot may actually improve your cognitive performance in memory-related tasks. Seventy-two participants, aged 18–44, had their working memory tested before and after running at a self-selected pace for 16 minutes, both barefoot and with conventional running shoes. The runners showed a 16 percent increase in working memory performance after running barefoot, while no improvement was experienced after running with shoes. It was hypothesized that the mechanism behind this phenomena is that barefoot running requires one to be more aware and further stress working memory abilities through processing additional tactile and proprioceptive information. Running barefoot forces one to be cognizant of each foot placement as a wrong step may result in impact with a sharp object, be more aware of ground contact as improper contact points or varied force may result in pain or disturbed gait mechanics, and be more in-tune with surroundings as the lack of support may mean that the loose gravel you stepped on could cause a twisted ankle. Like your muscles, the brain gets stronger with more activation. Having trouble studying for that big exam or remembering where you put the keys? Maybe it’s time to take off the shoes and go for a jog. You should consult your physician or other health care professional before starting any exercise program.